She has survived two murder attempts, her house was burnt down, she has received countless death threats, but nothing has stopped Susana Trimarco from looking for her missing daughter for the last 10 years. 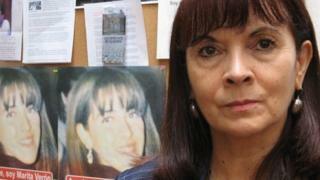 On 3 April Maria de los Angeles Veron, known as "Marita", went missing. In February, 13 people accused of kidnapping Ms Veron and selling her to traffickers who forced her into prostitution went on trial in a court in Tucuman province, in the north west of Argentina. This case has become over the years a symbol of the fight against human trafficking in Argentina and most of South America. Especially because of what Mrs Trimarco has done over the last decade. In the search for her daughter she infiltrated herself into human trafficking gangs pretending to be interested in "buying" women. The information gathered by these actions led to police raids which rescued dozens of women who were being sexually exploited. Mrs Trimarco later launched theFundacion Maria de los Angeles, named after her missing daughter. Since 2007 it has helped rescue hundreds of victims of sexual exploitation and human trafficking. Acts to commemorate Ms Veron's disappearance will be held today in Tucuman, and her mother is adamant that she will have no rest "until I find Marita". "3 April 2002 was the saddest day of my life. I will never forget that day, as it was when my daughter's life was destroyed," Mrs Trimarco tells the BBC. "This is a terrible pain I have permanently carried in my soul. I'm almost used to living with it." Talking to Mrs Trimarco is telling. Her stern face rarely seems to smile. She is not rude, but is strong in her words and gestures. "When Marita did not come back that day, I and my husband felt something terrible had happened. As a parent you just sense these things," she says. She and her husband Daniel, who died in 2010, asked at hospitals, and spoke to police and neighbours about Marita. No-one knew her whereabouts. After several days there was a breakthrough. Someone had seen her being pushed inside a vehicle by three men. And weeks later a prostitute confirmed their worst fears. They were told that their daughter had been "sold" to traffickers. Mrs Trimarco says the authorities in the province at the time, as well as former members of the police and the judiciary, were in collusion with the traffickers, which is why it was so difficult to find her daughter. She has recently testified in court, giving names and evidence backing her claims. In these cases, at least 228 people have been charged and 216 people are considered victims. At least half those victims are Argentine. 36% are from Paraguay, and 3% from the Dominican Republic. Only 40 cases have resulted in sentencing, with 71 people convicted and imprisoned. There are former police officers among the 13 people accused of Ms Veron's kidnapping. All deny the charges. A police detective, a friend of her husband, was a key figure in their search. With the detective's help, three months after Ms Veron's disappearance, they finally gathered enough information for the police to conduct a raid at a suspected brothel where their daughter could have been held. "There were about 60 women, all scantily dressed. Marita was not among them. I told these women that whoever was there against their will, they should step forward and come with us. Immediately a young girl rushed into my arms and did not let me go until we left that place," says Mrs Trimarco. The girl was called Anahi. Crucially, she gave details that confirmed that Ms Veron had been there, but was taken away before the raid. Anahi stayed for some time with Mrs Trimarco, until she was able to return to her family after receiving legal and psychological help. She is now a key witness in the trial. Armed with the information from Anahi, Mrs Trimarco decided to infiltrate human trafficking gangs, pretending to be a procurer of women. "I was not a public figure then, so that made it simple. I did not even tell my husband I was going to do this." She arranged a visit to a brothel in her province, where the women were, literally, sold. "Each one had a price. There were even underage girls as young as 14. All of them seemed terrified. When you looked at them they would lower their gaze and try to cover their barely dressed bodies with their hands", says Mrs Trimarco. "The coarse language of these girls showed the terror and pain they were going through," she adds. Mrs Trimarco did this three more times. The information she gathered led to a police intervention. At least 129 women were rescued by the authorities as a direct consequence of her actions. Many stayed at Mrs Trimarco's home. "It came to a point where I just did not have the capacity to help them all. That is when I decided to open a foundation," she says. In 2007 she set up her foundation, and today nearly 20 people, including lawyers, psychologists and social workers, help women affected by trafficking. The foundation has managed to get at least 800 cases of alleged sexual exploitation into Argentine courts, which led to the rescue of almost 400 victims. Mrs Trimarco was among those given the first US Secretary of StateInternational Women of Courage awardin 2007 by Condoleezza Rice, for her efforts against human trafficking. And in 2008 Mrs Trimarco's struggle and story helped get legislation passed in Argentina that for the first time made human trafficking a crime. Since this law came into effect almost 3,000 people have been rescued from human traffickers in Argentina. But Mrs Trimarco's daughter is still missing. "I have found victims who have been forced into prostitution for up to 12 years. My daughter can still be alive," she says. She is hoping the current trial, expected to end in the next few months, will provide new information about where her daughter may be. "I told the accused: 'If I can't have peace, you will never have peace until she is given back to me'. "I will keep looking for her, until I find her."